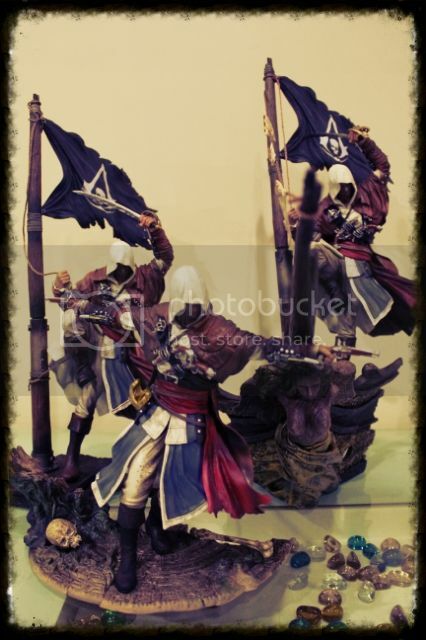 Dr Jengo's World: My AC IV Collection! Here it is! My entire AC IV Collection in 1 pic! Gonna look awesome as a display! The figures look real small here, just the sheer number of things in this picture. 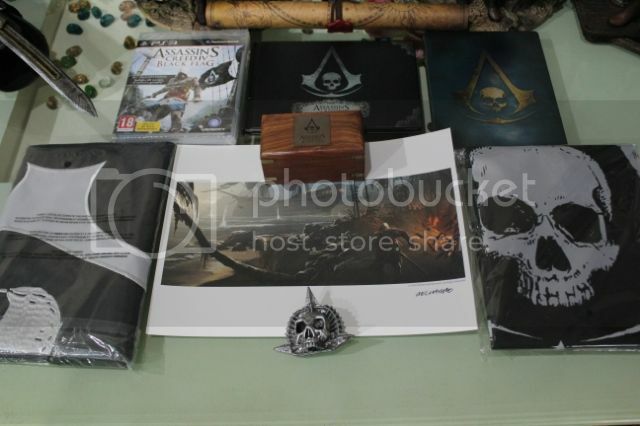 This is everything that I have related to Assassin's Creed IV.. Well almost.. 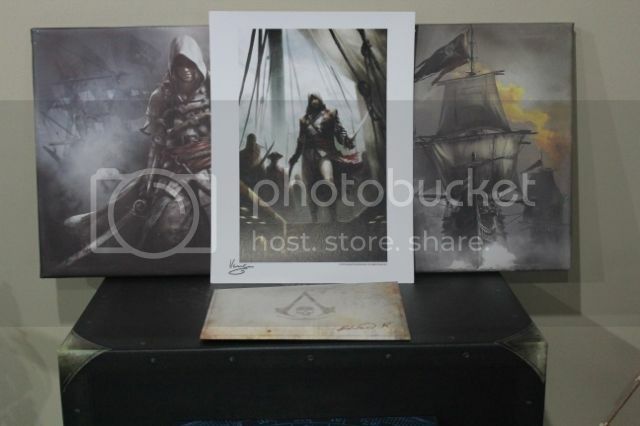 Missing a couple of things; I couldn't find the AC IV Cel Art, which is one of the first collectibles I got from AC IV, way before the game's release. It's in a bag full of comics and other art prints but I can't seem to find the whole bag. It's probably somewhere in there along with the other boxes. 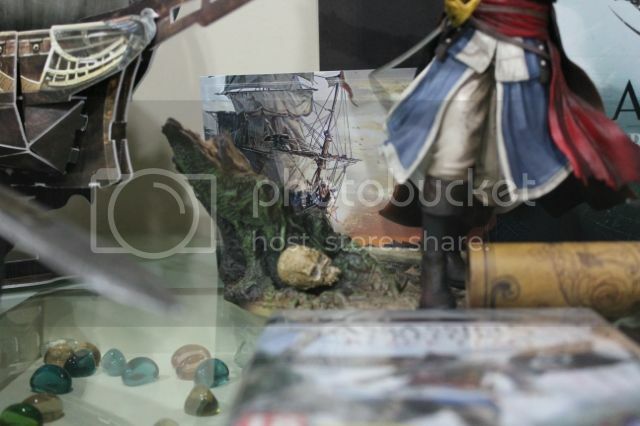 There's also the huge AC IV poster, which is the first ever item from AC IV. Then there's the Tankard which I totally forgot about when I was taking this pic. That's the problem when your items aren't on display, you forget what you even have.. 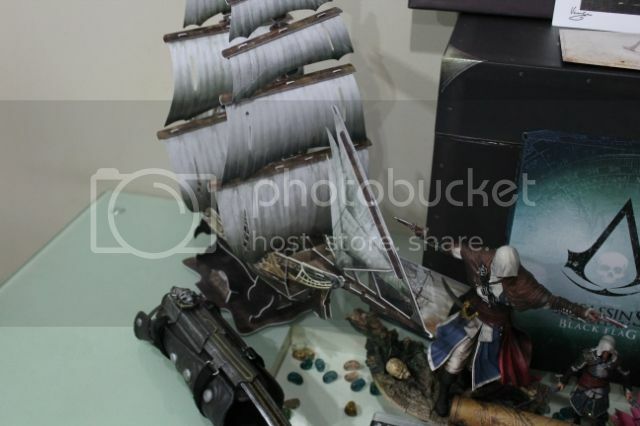 Some close-ups of the various items.. All stuff that you might have seen before in my blog before, with more detailed pics. A lot of cool stuff but I'm not done yet. There's still a couple more items coming in, but I couldn't wait to take this pic. 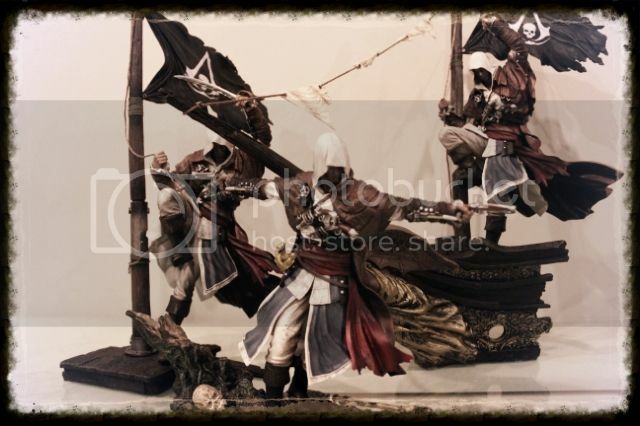 There's also some other items that I'm trying to hunt down but might not be able to get them anytime soon. It's been a fun several months collecting there. 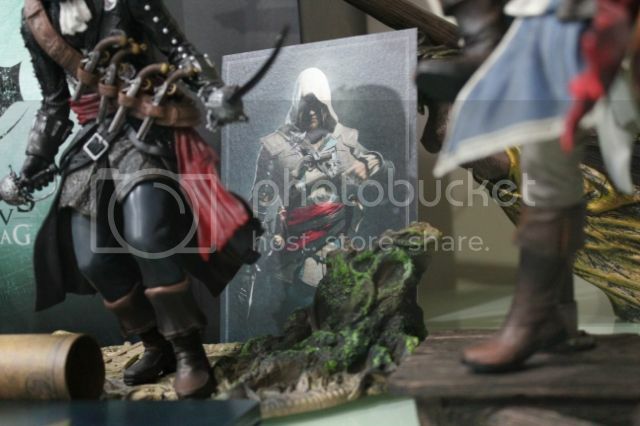 Many of these items have been announced way before the game's release, so the decisions on which to get, the pre-orders, the waiting etc have all made another AC release a fun year for collecting. The statues of every Assassin have always been my personal favourite but this year have thrown out more interesting items.. 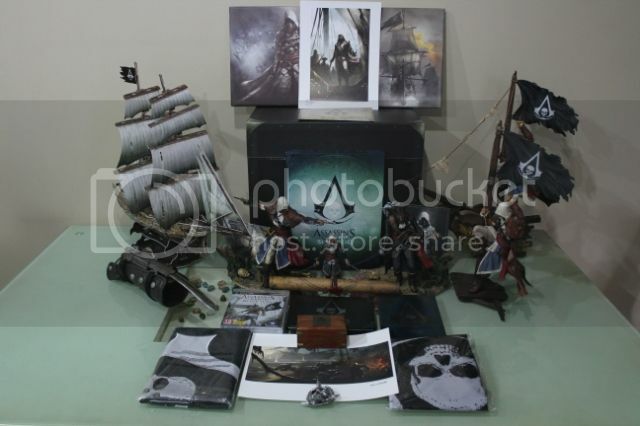 The Jackdaw Replica, The Art of AC IV book, the SpyGlass are all very interesting items in expanding my AC Collection. But I still feel the collection is incomplete.. Yes there are still more items to come but that's not what I'm talking about. 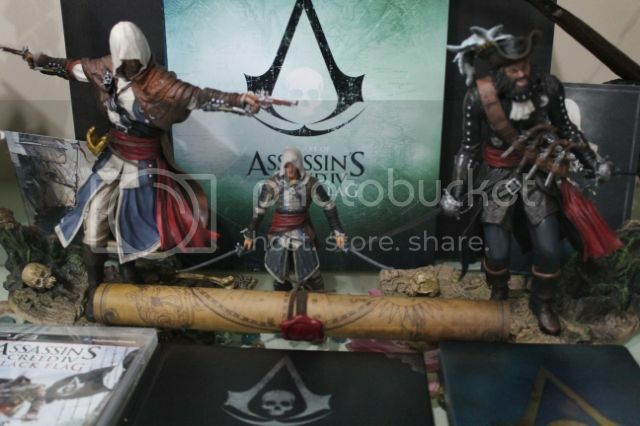 I have talked about AC IV is special in the entire series and the reason being that it was hugely developed in Singapore. 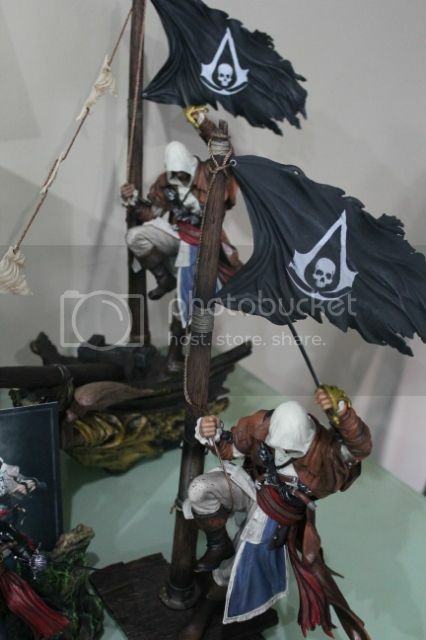 As a Singaporean, I feel a weird sense of pride when AC IV is discussed and Ubisoft Singapore is brought up. Of course, I have no direct connections to Ubisoft Singapore. But still it's special to know that a studio in Singapore has played a huge role in a Console game of this magnitude. So what I am getting at? Haha! PS4 Release in Singapore today! Quick Update on a No Update.. The Jackdaw (Replica) has been assembled!